So this 1942 film is not the version that writer/director Orson Welles wanted to be released. 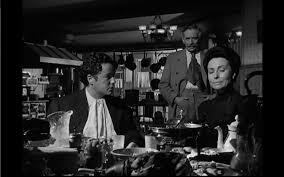 The studio, RKO, chopped fifty minutes out of it and added a more upbeat ending. But, what we do get to view is an interesting story about the positive and negative aspects of change. The film opens with the Narrator (Welles) speaking. 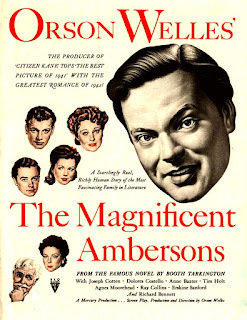 The Ambersons reached their “magnificence” back in 1873. However, we are told that their “splendor” existed in a town which would “spread and darken into a city.” Right up front we know that small town life can be threatened by progressive urban growth. The look of the movie, especially at the beginning, is one of an old newsreel, which, like the beginning of Butch Cassidy and the Sundance Kid, evokes a nostalgic feel, but also reminds us that what we are seeing are extinct images. The Narrator says that in the past, “they had time for everything. Time for sleigh rides, and balls, and assemblies, and cotillions.” Men and women courted in a measured manner, with serenades being part of the romantic process. He goes on with this epic catalog, with its numerous “ands” which slow the movement of the script, emphasizing the deliberate pace of prior times. Welles is showing a contrast with nineteenth century life and that of 1942. Imagine the difference between the high speed tech world of the present versus then. We now want to cram as much as we can into a life, but are we also not taking the time to appreciate the individual experiences? During this older time, “The only public conveyance was the streetcar.” The Narrator offers an ambiguity, saying this would be “too slow for us nowadays, because the faster we’re carried, the less time we have to spare,” as we always find something else that needs doing. 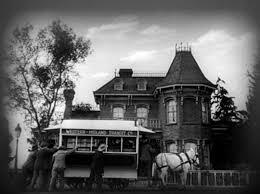 We see the streetcar stop at the Amberson mansion. This image and the talk of the leisurely pace of the streetcar will ironically contrast with what happens later. Anonymous townsfolk pop up occasionally, commenting on the Amberson family’s progress, a positive sounding word that does not fit the arc of these people. The citizens act like a Greek chorus, commenting on the action. They tell us that they admire the Amberson mansion for its well-appointed rich woodwork, plumbing, etc., and this admiration indicates the affluent nature of the family. We also learn of the failed attempts of Eugene Morgan (Joseph Cotten) to win the affection of Isabel Amberson (Dolores Costello). At one point it is said that Eugene is “dressing up.” That statement has the connotation that at that time, Eugene was out of his social league for pursuing Isabel. Eugene takes to drinking too much as a result. 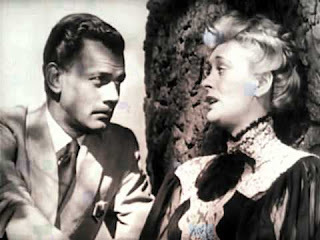 Isabel accepts the advances of Wilbur Minafer (Don Dillaway), a dull but reliable businessman. A townswoman predicts that Isabel could never love the likes of Wilbur, and would then shower all of her affection on offspring, spoiling the children. 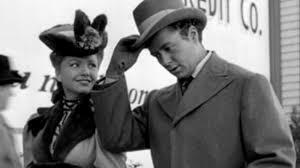 Time passes (of course, which is the point of this movie), and Isabel throws a party for the now young adult Georgie (Tim Holt). He may look older and his hair is shorter, but his speech and actions show him to still behave as a child. 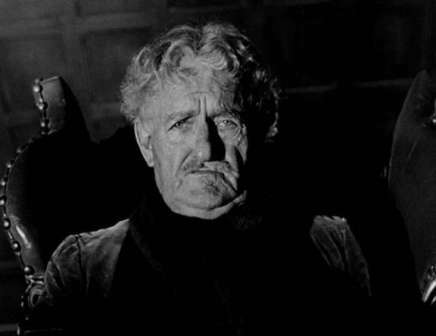 He is symbolic of the old privileged order, represented by the Ambersons, which does not want to change with the times. At the party, the long absent Eugene has returned, widowed, and with his grown-up daughter, Lucy (Anne Baxter). Georgie is immediately attracted to Lucy, but he can’t even remember people’s names, which shows how self-involved he is. He also makes self-indulgent statements like one should do whatever one likes in one’s own town. The implication here is that Georgie considers the place his town. His patrician attitudes come across to Lucy. He says he has no desire to be a lawyer, banker, or politician. Because he hasn’t had to work for a living, he has the distance to, one may say insightfully, question what these people, “ever get out of life, I’d like to know. What do they know about real things.” But, when Lucy asks him what he would like to become, he says, “A yachtsman.” Is he being funny, or is he that out of touch with the common man? Wilbur has suffered failures in his business ventures, and is experiencing ill health, probably as a result of his misfortunes. Isabels’ marriage to him has been suffering, and that is why she now is excited to see Eugene again. Since he drank too much earlier in life, Eugene will no longer indulge in alcohol consumption. He has moved up in the world, and is now a successful businessman. But, he is an inventor, and he has developed a new version of the automobile. He represents change. Georgie, of course, scoffs at this look into the future. Someone says it is like “old times” with Eugene’s return. But the inventor sees this reliving the past as an impossibility. He says, “When times are gone, they’re not old, they’re dead. There aren’t any times but new times.” The new times have changed the world order, and now we find Ambersons pursuing Morgans. 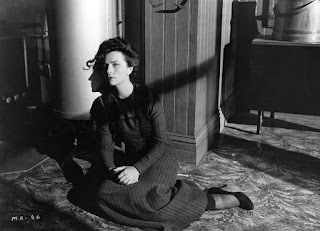 We also discover that Georgie’s Aunt Fanny (Agnes Moorehead) has always had a crush on Morgan, which adds to this reversal of fortune on the part of the Morgans. Georgie’s resentment of Eugene is on two levels: first, because he dislikes his inventions causing a change in the economic order, (he urges his family not to invest in Eugene’s business); secondly, he is jealous of his gaining his mother’s attention. Lucy, although seemingly in a perpetually cheerful mood, says to her father that Georgie is domineering and arrogant. At this point, Eugene does not want to judge Georgie harshly, and says that since he is Isabel’s son, he must have some fine features. 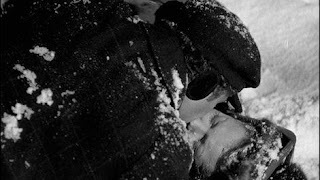 Welles provides us with a significant scene which symbolizes the precarious nature of both accepting change and also the maintaining of the status quo. 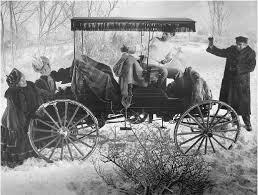 Eugene takes Isabel and other Ambersons on a car ride, but in the snow. The automobile gets stuck, unable to transverse the slippery road. Georgie, in a sleigh accompanied by Lucy, rushes past them. But, a sharp turn causes the sleigh’s occupants to tumble out. Georgie falls on top of Lucy, and he uses the opportunity to kiss her. One could interpret these proceedings as showing the shortcomings of progress in the form of the automobile, and that the old standby of the sleigh is more reliable. But, it, too, succumbs to nature’s trial. However, one could argue that Georgie would have been fine if he had not been distracted by Lucy, who, being the daughter of Eugene, represents the perilousness of the future, and which distracted Georgie, and altered his otherwise secure route. We have a scene where Lucy rides with Georgie in a carriage (not a car, of course). He wants to talk about the possibility of their marriage. She does not, and does say that he still should have some sort of professional plans. The best that he offers is the he will work with charities and belong to movements, acting like a “gentleman.” He offers nothing specific, showing no passion to really help. He just says what he believes is the way a person in his exalted station in life should act. He says that he does not see himself peeling potatoes or arguing a legal case. That is because he hasn’t had to do any work, expecting others to provide those services. He has had a free ride. Lucy does admit that her father would like to see Georgie choose a profession. The young man’s response is a bit contradictory. He says that he wouldn’t be much of a man if he let someone else dictate what he should do. But, he is willing to play the part that his family’s station in life has prescribed for him. 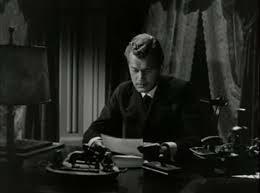 At a dinner party with the Ambersons and the Morgans, Eugene admits that his automobiles have changed the way people live, Streets have had to be widened. People living for convenience in small towns can now move farther away, because they can travel faster to other places. This fact undermines the pull to live in the town itself. Georgie says the car is a nuisance and shouldn’t have been invented. Instead of feeling insulted, Eugene becomes philosophical. He admits that his invention has not added beauty to the world or anything to the human soul. He acknowledges that every step we take forward in the name of progress, we may be taking a step backward for civilization. This statement may be the main theme of the film. 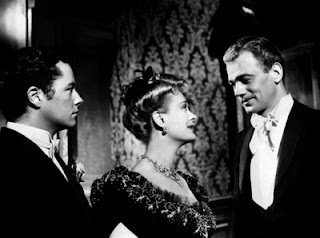 Although Fanny wants her nephew to undermine Eugene so that Isabel may relinquish him and he may then pay attention to Fanny, she eventually recognizes the truth. She says to Georgie that even if his mother was not in the picture, Eugene would not find her to be the one for him. She also says that Isabel was always a good husband to Wilbur, and that even though there may have always been some feelings between Isabel and Eugene, the two never did anything wrong. However, the Oedipal anger that Georgie has grows stronger as he sees Eugene as a longstanding interloper, and it is now that he refuses to let Eugene through that doorway into the Amberson home to see his mother. Eugene writes a letter to Isabel, saying that she must decide whether to move forward (a word representing progress and change), or have things remain (meaning resistance to change), which would entail Isabel choosing her son over Eugene. She lets Georgie read the letter. He at first is angry, then confused and depressed. Feeling the need to be nurturing toward her son, she says she will break it off with Eugene, and she and her son will go on a long trip around the world. In essence, do what the privileged class does, which is, remain detached from problems. Right after his mother’s decision, Georgie runs into Lucy in town. She admits that she hasn’t been in touch with Georgie because she says that they had been acting like little children, playing at being in love. She is ready (as a Morgan) to move on. He, obviously, is not ready for that. He tells her that he will be leaving with his mother and this meeting could be their last. She acts cheerful, and wishes him a nice trip. Her lack of feeling of loss disturbs him greatly. But, we then see that Lucy’s cheerfulness is just a false front, and she goes into a store looking for the equivalent of smelling salts, after which she faints. 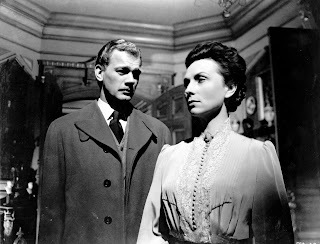 Jack Amberson (Ray Collins) returns from a trip to Europe and says that his sister, Isabel, was ill. But, Georgie does not want her to return home. After they do return home, the family still prevents Eugene from seeing the gravely ill Isabel. Even as she is about to die, Isabel still is indulging her son, asking if he ate something and if he was catching a cold. She asks if Eugene had visited. Georgie is honest and says that he had. Isabel’s regret is that she could not have seen him once more. Her decision to live in the past and not to move ahead with Eugene destroys her. The patriarch of the family, Major Amberson (Richard Bennett) had ruminated about how the progress of the town was rolling over him and burying him. After Isabel’s death, his family’s fortune depleted, he says that all his business dealings were a trifling and a waste. He has a terrifying look into the future, where he fears the Amberson name will not even be remembered. Now, no streetcar bothers to stop at the doorway of the once exalted Amberson home. 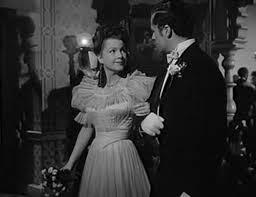 Uncle Jack, now financially broke, at the train station tells Georgie about an old romance, and how he said goodbye to her at the station. In one’s memory, she is frozen in his mind, and probably he is in hers. Only in memories can the forward marching of time be halted, and the magnificence of the Ambersons remain intact. As his train is about to leave, where it will take him to a new job, Jack says that they all thought Georgie was such a terror that he should be hanged. The Amberson house must be sold, and Fanny wants to move into a boardinghouse. She has no money, though, having lost it in a taillight investment, indicating that new order won’t accommodate the old. It is now that Georgie finally steps up to help pay for his aunt’s and his survival. He acquires a job in the legal profession, but he needs a high-paying job, so he works at a dangerous dynamite factory. The way to make money now is through risky businesses. Lucy reads that Georgie was struck by a car, and had both of his legs broken. This accident symbolically implies that the future is running down and trying to destroy any obstacles from the past that may try to stop its forward motion. Eugene and Lucy visit Georgie in the hospital The final scene has Eugene telling Fanny that Georgie felt that he was given the opportunity to tell Eugene how sorry he was for the way he treated him. The film seems to be telling us that, for better and for worse, change is an inevitability. The next movie is Amadeus.